Conventional techniques for spinal fusion often involve lengthy incisions and extensive muscle dissection. To have less invasive approaches that achieve equivalent or improved outcome with less approach-related morbidity would be better. Recently, percutaneous techniques for posterior lumbar interbody fusion and pedicle screw fixation of the lumbar spine were described in cadaveric and clinical studies. These procedures also can be linked to sophisticated image-guidance systems to enhance the accuracy of implant placement. Endoscopic techniques, such as laparoscopic anterior lumbar interbody fusion, have been adapted for anterior approaches to the lumbar spine. Although this approach is promising, important limitations have been identified. In a recent analysis of anterior lumbar interbody fusion that compared laparoscopic and open techniques, Kaiser et al found the laparoscopic approach to be associated with longer operative times and a much higher rate of sexual dysfunction in men, whereas the open approach provided better visualization and was technically less demanding. On the basis of these findings, Kaiser et al favored the open approach for anterior lumbar fusion. For similar reasons, Liu et al also recommended an open, rather than a laparoscopic, approach for anterior lumbar interbody fusion. 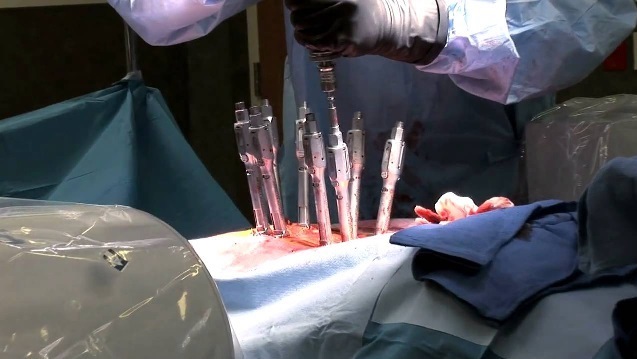 Also promising is the development of bone graft substitutes, such as bone morphogenetic proteins (BMPs), designed to enhance bony fusion while eliminating the need for bone graft harvest, often associated with donor site pain. Recombinant human BMP-2 was recently approved by the Food and Drug Administration for clinical use in anterior lumbar interbody fusions.33 It is anticipated that BMPs and other bone graft substitutes will have a wider role in spinal fusion procedures in the future. Minimally invasive spinal fusion techniques are in their infancy but are evolving quickly. Currently, most lumbar fusion procedures are performed via open approaches, with laparoscopic and percutaneous approaches being used at selected centers on the basis of surgeon preference.